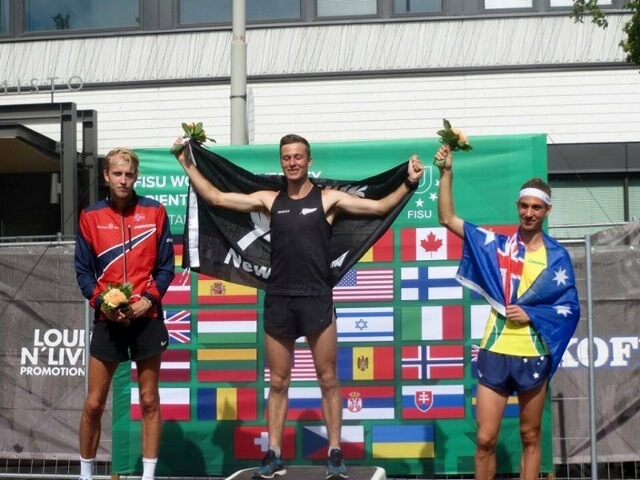 A day after finishing 11th in the middle distance, Tim Robertson has won gold in the sprint event at the World University Championships in Finland. 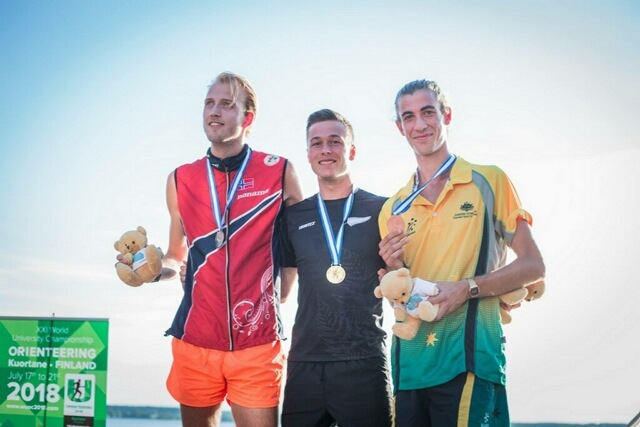 Tim’s margin of victory was 7.9 seconds over Trond Einar Moen Pedersli of Norway, with Henry McNulty of Australia taking the bronze. Outside WOC and World Cup races the WUOC are probably the toughest of the international championships. Hopefully Tim’s victory bodes well for the forthcoming WOC. Remarkably, this is New Zealand’s 6th gold medal of the northern hemisphere summer following Marquita Gelderman’s remarkable haul of 4 gold medals at the World Masters MTBO Championships (sorry I missed this earlier Marquita!) and Gillian Ingham’s victory at the World Masters Foot-O. Men: 1. Tim Robertson (NZL) 13:44.2, 2. Trond Einar Moen Pedersli (NOR) 13:52.1, 3. Henry McNulty (AUS) 14:08.3, 77. Jonty Oram (NZL) 16:52.7, 90. Kieran Woods (NZL) 17:40.2. Women: 1. Virag Weiler (HUN) 13:48.3, 2. Martina Ruch (SUI) 13:48.8, 3. Aleksandra Hornik (POL) 13:58.8, 76. Heidi Stolberger (NZL) 18:10.9, 85. Tegan Knightbridge (NZL) 20:41.9. Men: 1. Aleksi Karppinen (FIN) 36:14, 2. Paul Sirum (NOR) 36:21, Havard Haga (NOR) 36:32, 11. Tim Robertson (NZL) 39:25, 60. Jonty Oram (NZL) 57:27, 73. Kieran Woods (NZL) 69:10. Women: 1. Emma Bjessmo (SWE) 37:32, 2.Marie Olaussen (NOR) 38:51, 3. Johanna Oberg (SWE) 38:53, 58. Tegan Knightbridge (NZL) 65:47, 69. Marina Comeskey (NZL) 76:16, 76. Heidi Stolberger (NZL) 86:07.